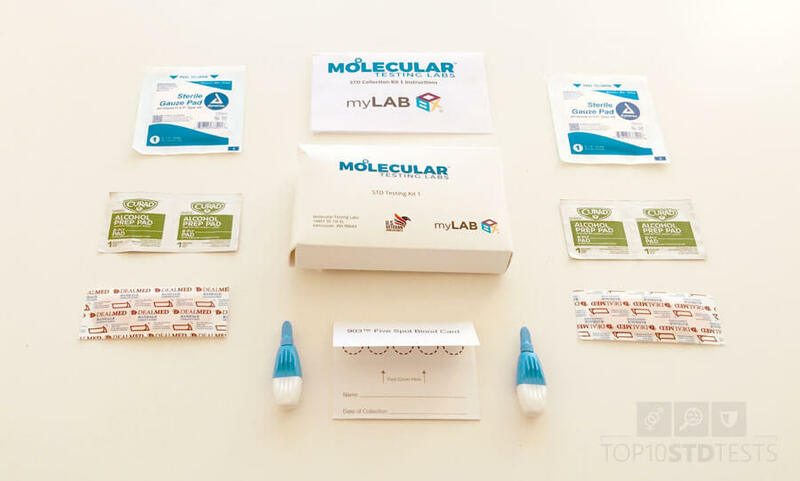 MyLAB Box is an at-home provider of STD testing that operates in all 50 states. Founded in 2013 in Los Angeles, California, the company encourages its clients to take control of their own health with affordable, convenient, and easy testing solutions for the most common infection risks. Apart from allowing you to keep things completely private with its at-home testing model, myLAB Box also provides free physician consultations from the comfort of your own home. There is no need to schedule appointments, drive or wait in line; the company even reminds its customers when it’s time to test again! If you’re interested in learning more about this revolutionary company and its services, you can read our in-depth myLAB Box review and take full control of your sexual healthcare today. Ordering online – Once you decide on a specific test, you can place your order on the official website. 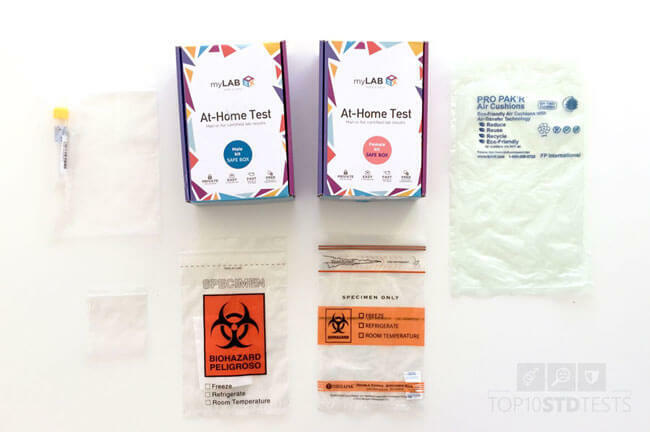 Testing at home – Depending on your order, you’ll need to provide a vaginal swab or blood/urine sample. The sample-collection procedure takes only 5 minutes and it’s completely painless. 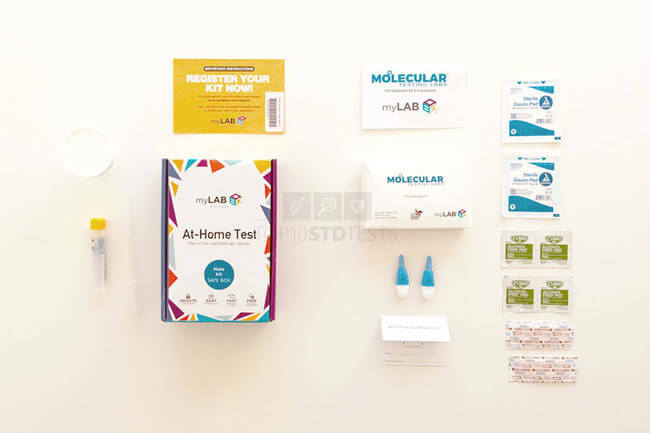 All at-home testing kits used by myLAB Box are 100% made in the United States by top-tier manufacturers. The kits are either certified by the company’s laboratory or FDA-approved. This means that myLAB Box tests feature the same diagnostic accuracy as those performed in a laboratory. Once you’ve collected the relevant sample, you can mail it back to the company in the provided self-addressed envelope and wait for your results. Did you know?Cosmetic testing samples are one of the “easiest” ways of contracting herpes. Getting the results – Depending on the test you’ve chosen, the final report will be generated within 1-5 business days. As previously stated in this myLAB Box review, the test results are as accurate as those done in a clinic. If your test comes back positive, you can schedule a same-day physician phone consultation completely free of charge. 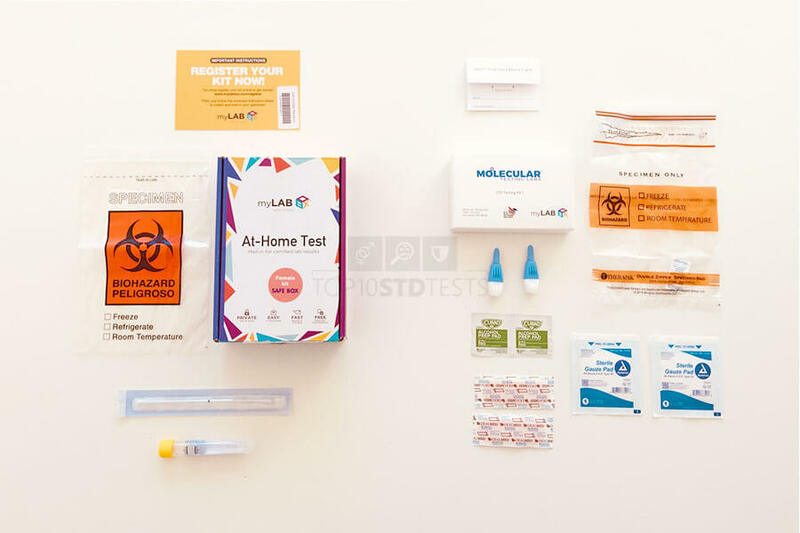 For the purposes of our in-house testing, we ordered the Safe Box testing panel that screens for chlamydia, gonorrhea, HIV 1 and 2, and trichomoniasis. We ordered both the male and female versions of the testing kit. Chlamydia is the second most common STD in the US and gonorrhea is the 4th. Both of them are completely curable if detected early, which is why it is so important to test regularly if concerned about potential exposure. These two infections are commonly screened together since they can both be detected using the same method. The final results are generated within 2-5 business days. This convenient panel screens for all the most common STDs, including HIV, gonorrhea, chlamydia, and trich. This selection covers 71% of all infections occurring in the US. The results are available within 2-5 business days. The Uber panel incorporates chlamydia, gonorrhea, HIV 1 & 2, hepatitis C, herpes simplex 2, syphilis, and trichomoniasis (trich, trichomonas). The results usually arrive within 3-5 business days from the time you return your sample. The Total Box panel screens for gonorrhea and chlamydia (genital, throat, rectal), HIV 1 & 2, hepatitis C, herpes simplex 2, syphilis, mycoplasma genitalium, trichomoniasis, and HPV (optional extension for women 30+). The Love Box is designed to accommodate couples with STD concerns. It contains 2 test kits for the aforementioned 8-panel test kit. This testing option was introduced to allow women over 30 years of age to screen for 14 types of high-risk genital HPV, including HPV-16 and 18. HPV causes cervical cancer, so detecting potential infections can help prevent or successfully treat it. The average turnaround time for this test is 2-5 days. V-Box was created to screen for all the usual causes of abnormal vaginal discharge. It covers all common yeast and bacterial infections, chlamydia & gonorrhea, and trichomoniasis. The usual turnaround time is just a couple of days. MyLAB Box collects the information you provide, which is used to respond to your requests, communicate with you, and customize your future shopping, as well as automatic information, which is gathered with cookies and similar programs. When you download and use myLAB apps, the company can receive information about your mobile device and location, including a unique ID for your device. You can always turn off location services if you don’t want to receive localized ads, search results, and similar personalized content. The company receives confirmations when you open its emails in order to keep them interesting and relevant. You can always turn off email notifications by following the unsubscribe link in the most recent message. Did you know?Antibiotics can mask a sexually transmitted infection in your urine or blood sample. MyLAB will share your personal information within the established business scope, which includes third-party service providers, promotional offers, business transfers, and protection of the company. MyLAB incorporates SSL encryption in order to protect any information you provide during your communication with the company. Bottom line, we think myLAB gives itself a bit too much freedom with sensitive data gathered from its customers and we would like to see this changed in the future. At this point, the company looks like it cares more about ad revenue than the privacy of its clients, which is definitely not the image they want to create for themselves. MyLAB Box accepts all the usual payment methods (credit/debit cards, prepaid cards, etc. ), including FSA and HAS cards. You currently can’t pay for the tests with your insurance, though. This does take away one of the relevant payment options, but it increases your level of privacy and security since your insurance company won’t receive any information regarding your STD testing and the results won’t enter your permanent medical records. You can contact myLAB Box customer support by phone or you can send them an email Mon-Fri 8AM-12PM PST and Mon-Fri 2PM-2PM PST. You can receive relevant information about your order and ask any general questions that come to mind regarding the company itself and its services. If you are still not certain if myLAB Box is just right for you, knowing its advantages and disadvantages can help you make an informed decision. 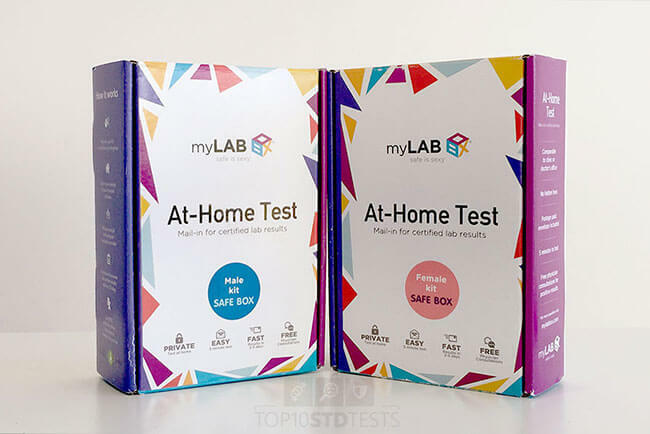 MyLAB Box has great potentials with its at-home STD testing model, but it all feels a bit rushed, for the lack of a better term. You can’t get all the necessary information from the official website and we can see the company representatives spending much more time beating on the competition rather than giving us information about their company. The testing portfolio is quite impressive, but we would also like to see a bit more information about the tests themselves rather than generic info about their respective infections. However, the accuracy of the results is extremely high and the prices are more than budget-friendly, which is what should interest you the most in the end. We hope our myLAB Box review helped you familiarize yourself with the company and its services and make the best choice for your sexual health. Our ratings are the result of an objective and independent evaluation of myLAB Box, generating the final rating that reflects the overall quality of the company. Ratings may change as the service changes. myLAB Box user rating based on 5 user reviews. The love box is spot on if you want to enjoy with your partner without any concerns. 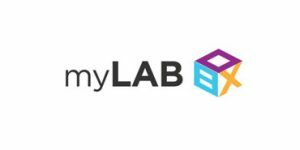 We found 3 verified myLAB Box discounts for April, 2019. Sign up and we’ll let you know about future myLAB Box promo codes. If you like myLAB Box but aren’t sure whether they are truly the ideal choice for you, you may want to take a look at our comparisons below to discover if one of their competitors is more suitable for you.